Order creates space and efficiency. 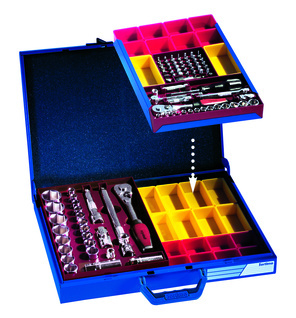 The Sortimo service case has become a classic in its field. For more than 35 years tradesmen have become to trust and rely on the Sortimo case. Even today, first generation service cases are still at work. Meanwhile the case has been further developed and optimised – one thing will never be changed: its functionality and unrivalled quality. High quality steel and tough powder coated finish make the Sortimo case almost indestructible. The case locks automatically when the lid is shut. The lid foam inside the lid forms a good seal on top of the inset boxes. No small items can migrate from one compartment to another. Only the original case has the Sortimo logo!